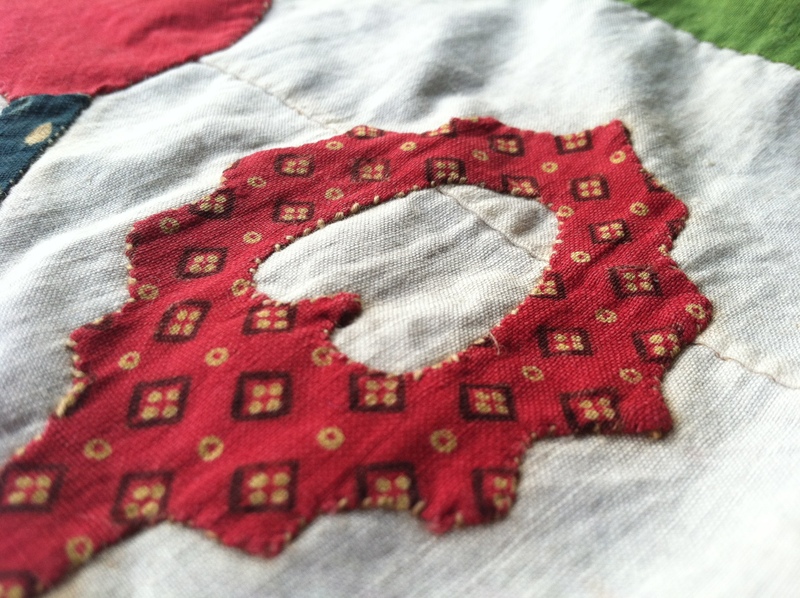 This is a fragment of an applique quilt top that I bought from quilt dealer Mary Koval many years ago. My original interest in applique started when I saw a show-stopping Baltimore Album quilt at the Folk Art Museum here in New York. I taught myself to applique because I wanted to be able to replicate that intricacy and perfection. As time went on, though, I found that I really loved the funkier, less-than-perfect quilts even more. The background fabric of two of the three blocks are pieced, suggesting that they were cobbling together something from whatever was available. In the detail above you can see that more than one color of thread was used. A green for the darkest fabric and white for just about everything else. 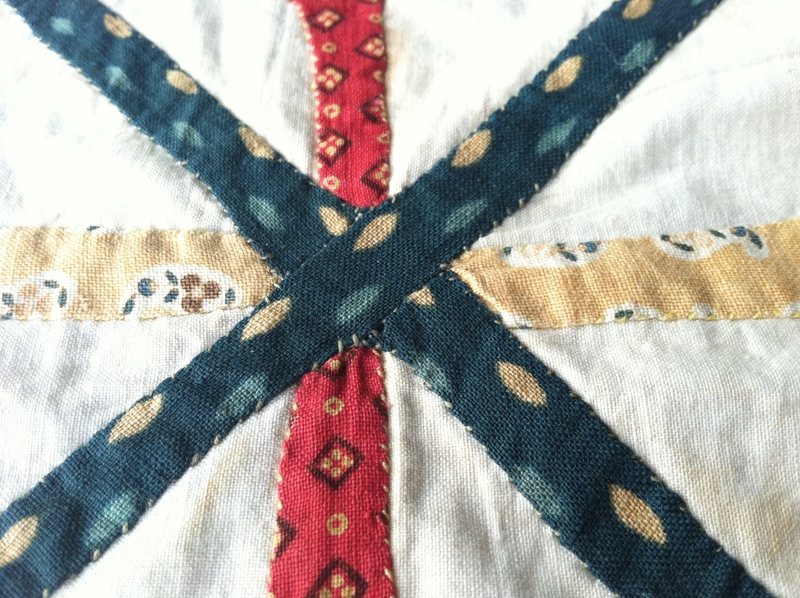 The seams are also hand-pieced, using 1/8″ seams. 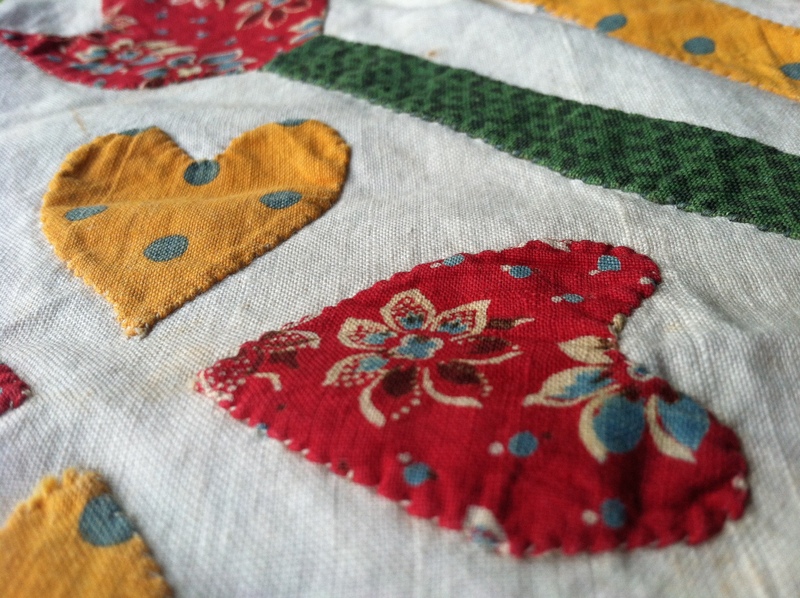 The hearts and tulips block above has some lovely little cut outs in the larger hearts – hearts within hearts – that are wobbly, at best. They also happen to look like very happy little faces, if you look at them from the right angle. 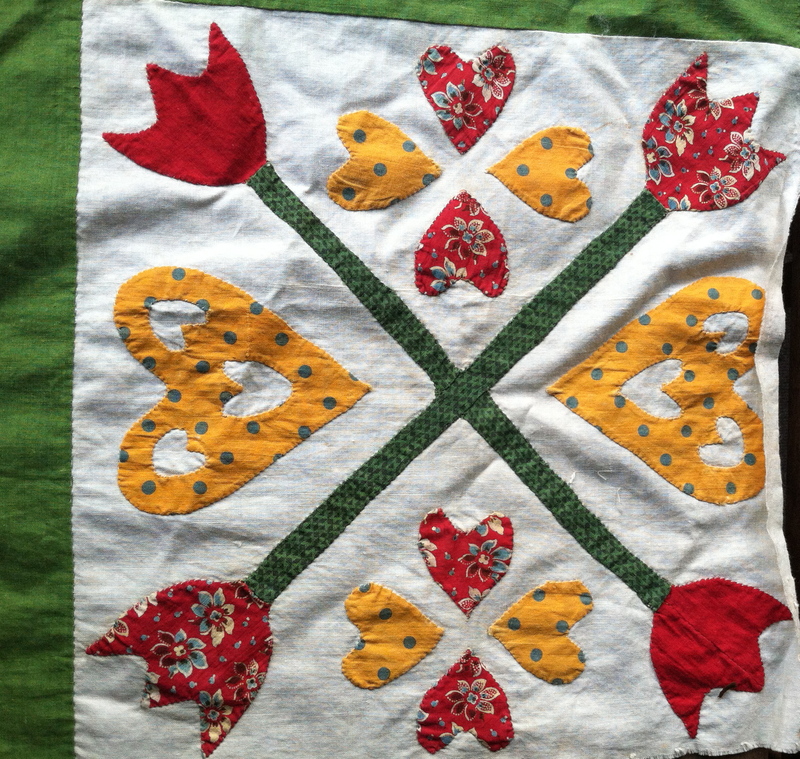 The tulips with hearts block, above, is the one with two seams in it (back detail shown earlier). The intersection of the pieces at the center of this block seems rather ad-libbed. Looking at it closely, there was barely any seam allowance tucked in under the dark prussian blue stems. The reel and tulips block is the only one with the solid blue fabric. You may notice that there’s a bit of yellow/brown staining all around the blue. I’ve been told that there was a time period when a certain green was available that often lost it’s yellow over-dye. The solid blue here may once have been green. 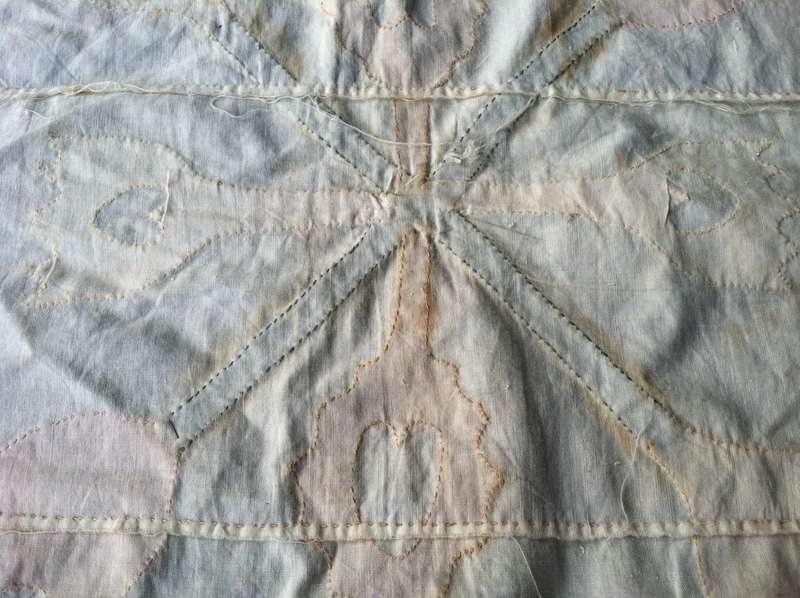 That particular blue (more on that in another post) may date from the 1850s, although I can’t really date the applique piece only by the inclusion of that fabric. The intersection of the reel pieces, the leaves, and the tulip stems is pretty imperfect. Imperfect, but it works. These days, if you entered a quilt like that in a show, you wouldn’t get top marks for technique. Thankfully, this seamstress wasn’t concerned with things like that. 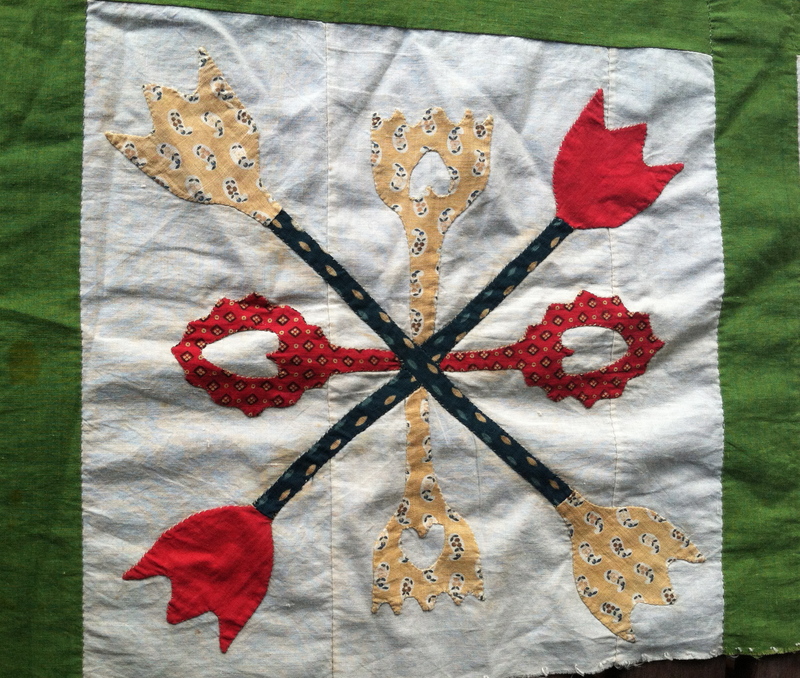 I always admire these old quilts and the quilters who made them for their persistence. Don’t have enough white fabric? Piece it. Ran out of one blue? Use another one. One thing that’s interesting to note, that might not be something that comes through in the photos, is that the fabrics are all quite fine. High thread count, for sure. 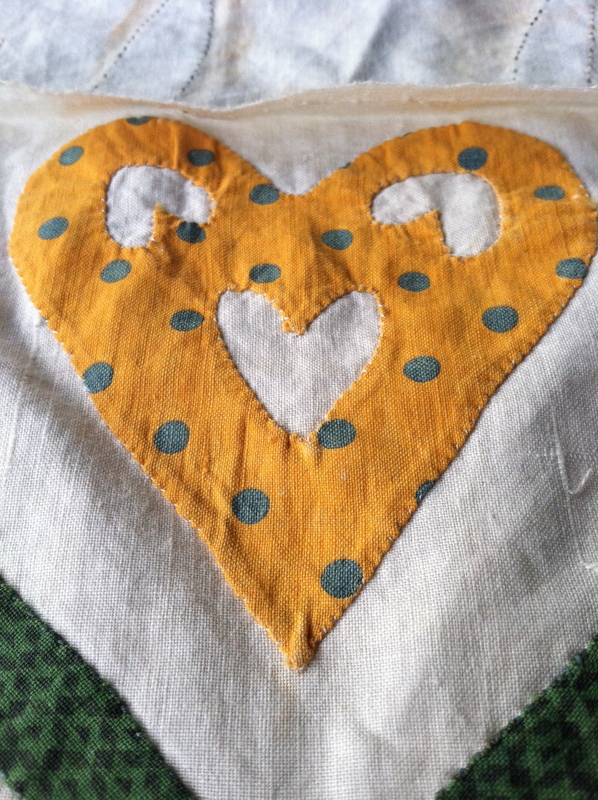 That would make the applique easier to execute, including those fiddly cut-out hearts like the one above. 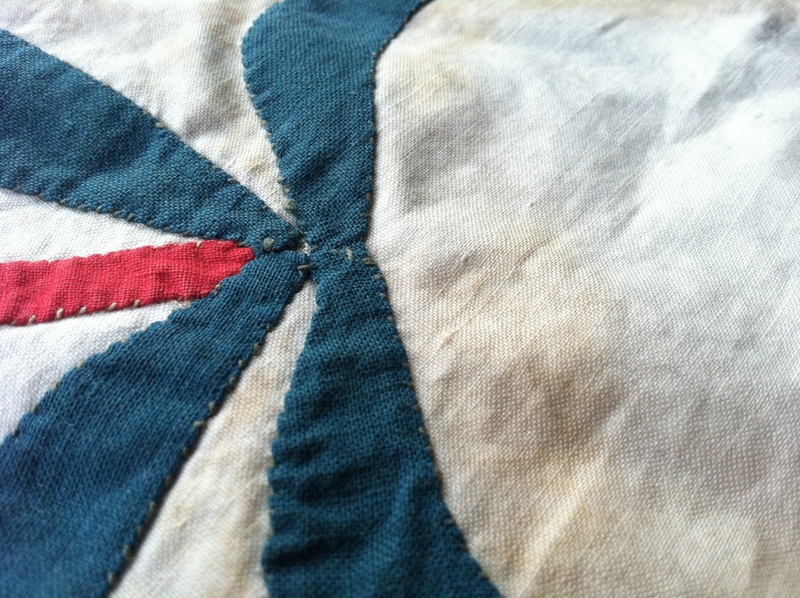 The applique stitches themselves are very neat, very regular, and quite sturdy. While the edges may be slightly wobbly, they’re not going anywhere. 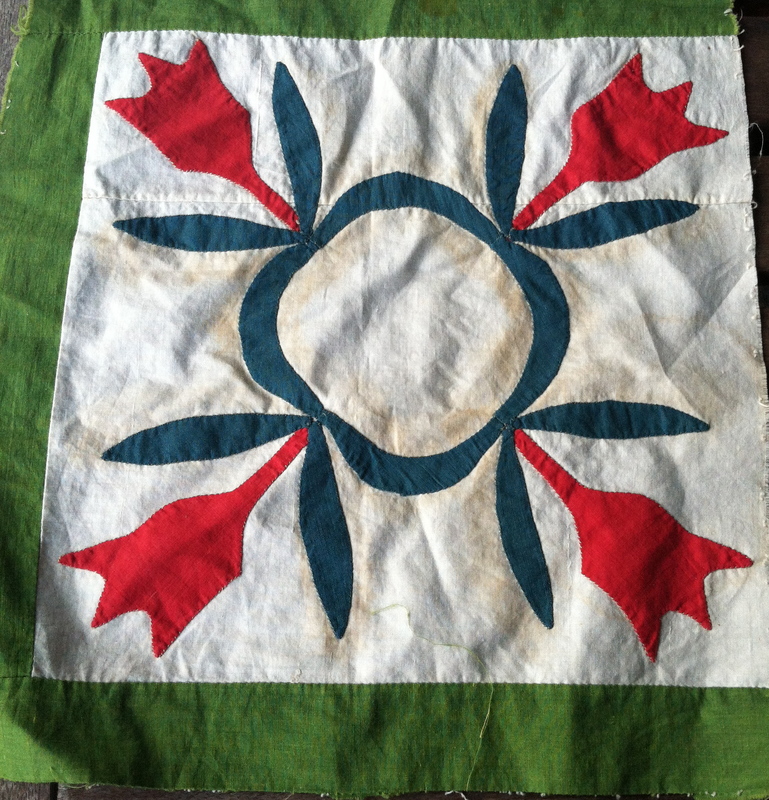 If this quilt had been finished, it would have withstood some use, some wear and tear. There’s also no saying that the quilt was a second-best project. It’s sewn with a lot of attention to detail. It’s possible that the seamstress just didn’t have much to work with, and so pieced her backgrounds. Or perhaps she was just frugal. Whatever I read into it, these blocks are happy. Bright cheerful fabrics, classic designs with some lightheartedness thrown in. Here’s hoping that your day is filled with less-than-perfect things that make you happy.